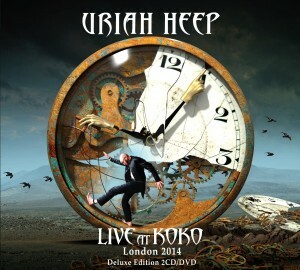 Share the post "Album review: URIAH HEEP- Live at Koko (CD/DVD)"
Uriah Heep’s long career has been punctuated by regular live albums – 1973’s ‘Live’ with original singer David Byron, the Live In Moscow opus which opened up what was to become their longest-running line up with Bernie Shaw and Phil Lanzon and a recent series of Official Bootlegs, to name but three. So is another live album a relevant offering or just cash in? This CD and DVD package was recorded at a special one-off show at London’s Koko last year, which I imagine was attended by many of Heep’s fanatics from the continent as well as the home crowd and even on the CD the atmosphere does seem to have a sense of occasion to it. The other reason to welcome a live album is as a statement of where Heep are at this stage of their 45 plus year career. Trevor Bolder sadly passed away a few months prior to this recording but with a new younger rhythm section of Russell Gilbrook and Davey Rimmer in place, this recording suggests that Heep are moving forward with a vitality you might not expect from such a veteran band. They certainly rock harder at this stage of their career than Deep Purple, who they were always likened to. ‘Against All Odds’ is a great opener with the battle between Mick Box’s guitar and Phil Lanzon’s organ introducing us to the trademark Heep sound. There are sprightly, evergreen versions of the likes of ‘Sunrise’ and ‘Stealin’, while Bernie Shaw appears over the years to have acquired a raspier edge to his voice. Among a generous selection of more recent songs there is a trio from ‘Into The Wild’ and the likes of ‘I’m Ready’ and the title track have much more force than their studio counterparts. ‘Between Two Worlds’, dedicated to ‘our friend’ (i.e. Trevor). has a vintage solo from Mick as well as the trademark Heep high harmonies, and the impression throughout is that the keeper of the Heep flame can never have played better. Criticisms? Well after a period when they delved deep into the back catalogue, the Heep setlist over recent years has retreated back into a comfort zone and the set on view here is almost identical to the 2013 tour and slightly predictably mixes their Greatest Hits with a generous selection from their most recent albums, yet the 1974-1995 era is only represented by one song in ‘Free And Easy’. ‘Traveller In Time’ is perhaps the nearest to an obscurity. There are even two new songs from their last album ‘Outsider’, including ‘Can’t Take That Away’ with some classic Hammond work from Phil, which the crowd would not have known at the time but now brings the live album up to date as a representation of the current set. ‘Gypsy’, ‘Look At Yourself’ and ‘July Morning’ respect the originals yet come over both heavy yet enduringly fresh. The irony is that the album, and every Heep gig’s climax ‘Easy Livin’ is rather spoiled by a slightly rough sounding and at times almost semi spoken vocal by Bernie. This entry was posted in ALBUM REVIEWS, ALBUM REVIEWS (Mobile), All Posts and tagged Bernie Shaw, classic rock, Davey Rimmer, gig, heavy rock, Koko, live album, Mick Box, Phil Lanzon, review, Russell Gilbrook, Uriah Heep. Bookmark the permalink.